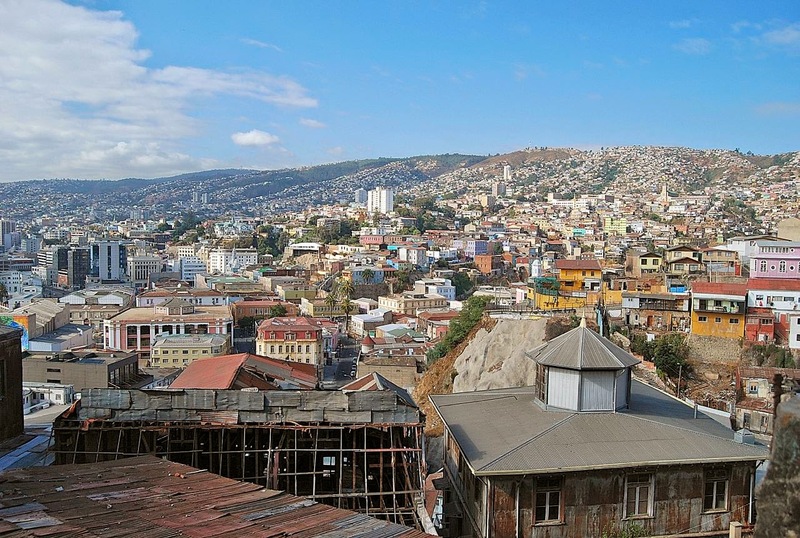 I rarely include guest posts this blog – in fact, I don’t think I’ve ever done so – but late last week, I received an eloquent email from Janak Jani, owner of Valparaíso’s Hostel Luna Sonrisa that made me consider it. In the aftermath of the city’s catastrophic fire, his letter offers far greater detail to support the generalities I recently wrote from a distance. Because of that, I asked his permission to include it here; I have made minor editing changes, including spelling (Janak is British and I use US English), punctuation, and brevity, and added hyperlinks where appropriate. I have made a few additional comments, also in italics, at the end of Janak’s piece. The Google Earth image here suggests the extent of the fire. The Youtube footage below, before Janak’s text begins, offers an aerial overview of the burned areas (though the melodramatic music is unfortunate). On Monday we went back to the area affected by the fire. What a contrast to the previous days! Most of the thousands of volunteers we had seen digging out rubble were back at school and university (apparently some had gone on strike to try to persuade those in charge to give them another week off classes to help –- work that the government and armed forces should be doing but are not). 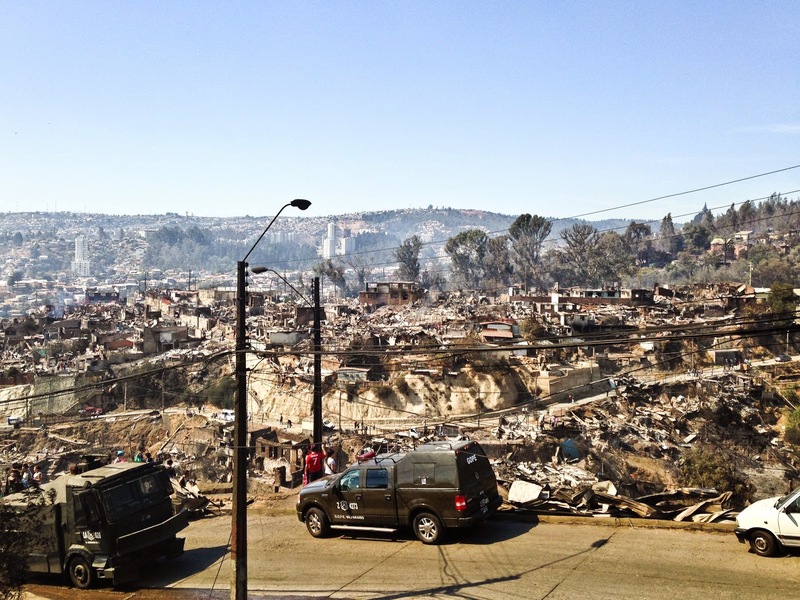 The streets were now mostly passable, with rubble, metal and ash piled up by the roadsides and the occasional private truck ferrying scrap metal up and out of town. On every street corner a pair of soldiers in combat uniform were stationed, each with an armed sub-machine gun, with instructions to maintain order, some seeming quite sensitive to the tragedy around them but others strutting around with their guns at the ready, fingers on the trigger, reveling in their moment of power. Meanwhile the locals were milling around their tents and distribution centers. The tents are dotted about on different plots of land. Some of the displaced have gone to shelters downtown, but others do not want to leave their land for fear of being evicted (there is already official talk of this). Many have already started rebuilding, hoping to show the government a fait-accompli when the time comes. We had driven up with a pair of tourists from Europe who had been visiting when the fire broke out and who had donated tents and other equipment. Both were visibly affected by the enormity of the disaster and the resilience of the victims, but what shocked them most was the lack of visible official help. The municipal government had (belatedly) set up a couple distribution centers for essential items, but these are too far away for many people to carry goods back to their plots. The armed forces were busy patrolling but were not lifting a finger to help. Over a week after the disaster, my European friends could not believe that there was no heavy machinery working night and day to clear the burned out ruins and ash. It is obvious that if this is not dealt with before the year’s first big rain (due any time), there are going to be huge landslides that will affect far more of the town than the fire-affected neighborhoods. The army has the resources to do this, yet the only people we saw helping were civilian volunteers. We made our way down to Paradero 10, Cerro La Cruz, on the corner with Los Chonos, where we met with Yamilé, the angel we had met two days before when we drove up in two vehicles laden with food, water, cleaning materials, diapers and blankets that we had taken from the municipal depot downtown. Having passed the first checkpoint we were told by a military police lieutenant that only one of our vehicles could continue into the disaster zone. We showed him that we were carrying essential items and showed our certificate giving us official permission to enter but he would not budge, rather repeating the mantra “no” until we had no option but to give up. His last argument was that there was too much traffic below us in the burned out areas. We took a photo in the heart of this very area 20 minutes later – the streets were all but empty! We managed to sneak in the second vehicle anyway through an alternative route. Yamilé is a street vendor from the other side of town but, like hundreds of others, she has temporarily given up her day job to help. She had set up an unofficial distribution center and canteen in a relatively isolated part of the stricken area and had been working with little rest for seven days and nights. While a few of the concrete buildings by the roadside had survived more or less intact, in the gullies everything had been wiped out and those people that remained were living on bare patches of dirt and ash, if they were lucky in tents, or otherwise under rudimentary makeshift shelters or even in the open. These were the people Yamilé had decided to help. We stopped our truck and asked one of her assistants what they needed from us. We had some plastic basins which they wanted as they were planning on having a hair-washing session, and diapers for adults and children which they were handing out. Until that point we had been stopping every 100 meters dishing out goods piecemeal to whoever seemed in need, but after five minutes talking to Yamile and her crew we decided to leave everything with them as they were better placed than we were to distribute aid effectively. We asked them what they urgently required and were told “tents, flash-lights, bedding, more diapers and most importantly, kitchen equipment.” Tons of food aid had made it up to the hilltops. Families had boxes of rice and pasta but no pots and pans and no means to cook. That afternoon we made another run from the depot with diapers and blankets and we made the decision that we would use the funds we had raised so far to buy flashlights and kitchen equipment. So on Monday we arrived at Yamilé's headquarters with a dozen stoves together with bottled gas, pots and pans and two dozen wind-up flashlights. Yamilé's idea was that rather than distribute through her, she would take us down the quebradas to see for ourselves those living in the most precarious conditions and make direct donations. Our idea was to find large family units or small groups of families who could make the most of the stoves by sharing one among many. Throughout the afternoon we handed out our mini-kitchens and met with the same response over and over again – gratitude at being given the dignity to be able to cook in a family unit and begin to have a semblance of autonomy. Although this is just a drop in the ocean, thanks to the donations we have received we have been able to make a small difference to perhaps 200 people. With the rest of our donations we are looking for new projects. It costs about 650,000 pesos [about US$1,150] to buy materials to build a basic one-room cabin. There are also some soup kitchens that are short of equipment. We are also interested in helping to fund the Red Popular de Alimentación, a group that is running 30 independent food distribution centers in the hills with a long term project to turn them into permanent community centers once the neighborhoods have been rebuilt. Having persisted on this topic for several entries now, I plan to move on to other topics in Argentina, Chile and elsewhere. Still I expect to revisit the matter on occasion, and would urge readers to consider donations through Janak, as I suggested in my previous post. 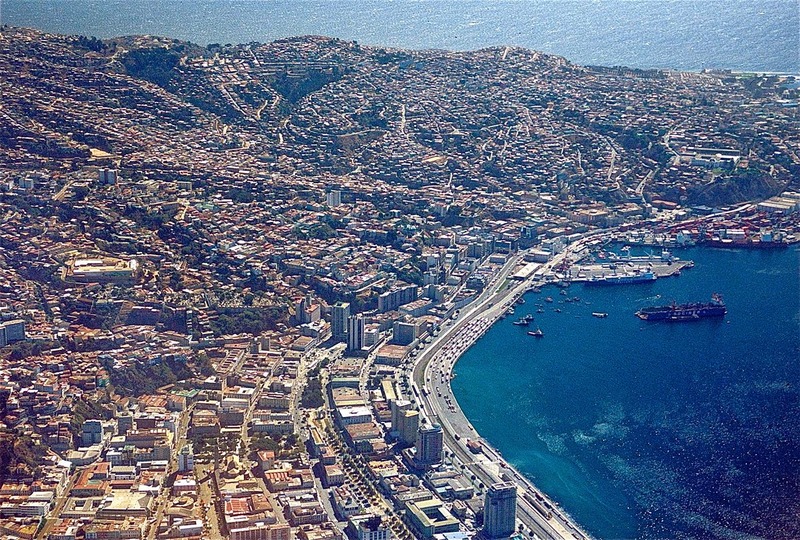 The flames have subsided, but Valparaíso will be sweeping out the ashes for a while more. 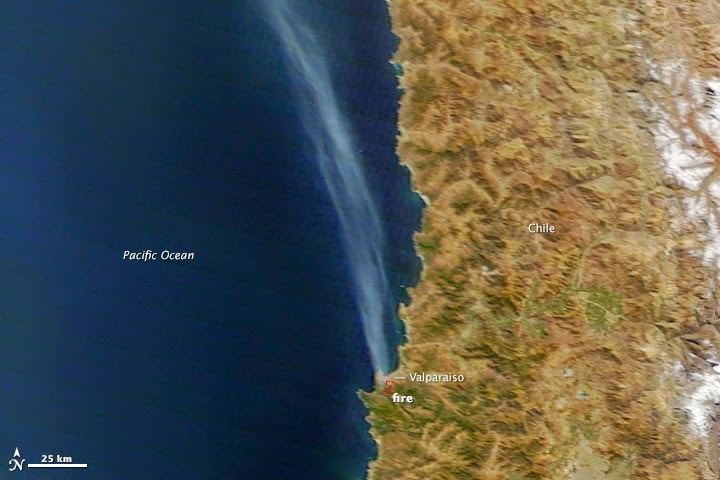 According to the most recent figures, the April 12th fire that started on the city’s outskirts destroyed some 2,500 homes and left more than 11,000 Chileans homeless (aerial photo by NASA). It’s not totally clear what started the fire, but the Chilean police claim to have located the focal point at Fundo Los Perales, an agricultural property adjoining the Vertedero Los Molles, a municipal trash dump. According to their account, sparks ignited by two electrocuted birds were the cause, though that explanation sounds incomplete at best. Still, disaster relief is the important issue here. While autumn weather is normally mild in this Mediterranean climate and little or no rain is forecast the rest of the month, the rainy season is approaching – this makes relief more urgent than in the recent earthquake in Iquique (where it almost never rains) or the massive February 2010 quake (which gave authorities more late summer leeway). Janak notes that he’s working with a local organization, the Centro Cultural Trafón, “to provide direct aid to those that need it most” with Chile. For non-Chilean residents, he’s also accepting direct donations to purchase “food, medical supplies, tents, mattresses, blankets, sleeping bags, pots and pans, flash-lights, tools etc.” I wouldn’t normally solicit money on this blog but, given my trust in Janak and the worthiness of the cause, I’ll include his information here. Those without Sterling accounts can donate to his Paypal account, janak@vtr.net. Not so long ago, I remarked that Argentina needs to create new banknotes because the country’s galloping inflation had made dealing with cash so unwieldy – with the largest denomination at 100 pesos (less than US$10), the volume of bills is stressing the capacity of our wallets and, as far as I know, even ATM machines (though I have not used an Argentine ATM for quite some time). Bills of 200 or even 500 pesos would be a relief to overstuffed wallets. Last week, President Cristina Fernández de Kirchner finally announced a new banknote, but it was not what the country needed. 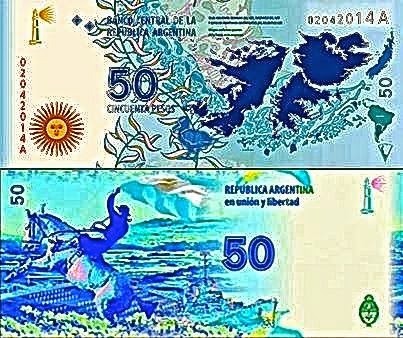 Instead of printing larger bills – which would have been a tacit acknowledgment of the inflation problem – her government chose to introduce a new 50-peso banknote with a map of the Falkland Islands. Even worse, she made the announcement on the 32nd anniversary of the Dirty War dictatorship’s foolish invasion of the Islands, despite the fact that her administration (and her late husband Néstor’s) have made a point of condemning the murderous military’s human rights abuses. The hypocrisy did not pass unnoticed. While Argentines may be virtually unanimous in their opinion that the Islands should be Argentine, some were vocally upset that the government commemorated their claim on a date linked to the dictatorship. Hernán Lombardi, cultural secretary of the city of Buenos Aires, unleashed a series of bitter tweets, including the statement that “Celebrating April 2nd as a holiday follows a logic that could end in a monument to [General Leopoldo]Galtieri. Not in my name!” Independent journalist Uki Goñi, who has written eloquently on human rights issues, tweeted that “It would be beautiful to celebrate the Malvinas on another day not the anniversary of April 2, 1982,” linking to a YouTube video of the masses applauding Galtieri on the Plaza de Mayo (see below). In fairness, the national government was not the only one to engage in silly symbolism last week. 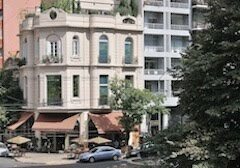 The Buenos Aires city council, in a similar measure, voted to rename the block-long street of Inglaterra (“England,” in the barrio of Agronomía) as “2 de Abril,” after the date of the invasion. Apparently, few in the neighborhood agreed with the change, but those opposed were reluctant to speak out publicly. Perhaps it’s too much to expect Argentine politicians to abandon grand (or petty) symbolic gestures, Even if they can’t do so entirely, a good model to follow might be the postage stamp (pictured above) issued to commemorate the 1829 establishment of the “Political and Military Command of the Malvinas Islands” by the United Provinces of the River Plate (a precarious precursor of modern Argentina). Commander Louis Vernet, a German Huguenot businessman who had settled in the Islands some years earlier, was primarily interested in commercial sealing. At the same time, it’s perhaps worth noting that the obverse of the new banknote contains an image of the gaucho Antonio Rivero, who murdered five holdover employees from Vernet’s settlement after the British assumed control in 1832. Some Argentine sources have tried to portray Rivero as a political folk hero against the British, but it’s likelier his grudges stemmed from management maltreatment. Meanwhile, Argentines will continue to wait for larger banknotes to conduct their daily business, as the new 50-peso bill is barely worth US$5.